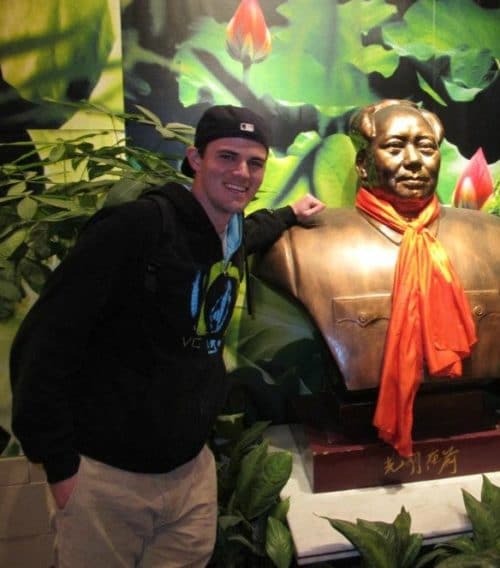 This week on our Lessons in Learning Chinese series, we feature Nick Menefee who’s been studying Chinese for 5 years, worked in China and now does business development in China and Southeast Asia. I graduated from the University of Virginia in 2011 where I studied Commerce and Chinese. After school, I spent a half a year in Shenzhen teaching English but decided to head back to the States to begin a career in International Business. Currently, I work at a machinery company in New Orleans, Louisiana, attempting to develop their operations in China and Southeast Asia. From here, it is unclear what my direction will be, but I am sure that it will consist of a number of endeavors back into China. I studied Chinese consistently for around 5 years, from my freshman year of college until returning home from Shenzhen. The entire time, I knew I wanted to become proficient enough to speak in a business environment. Along the way, China’s culture and overall worldview fascinated me, which is probably the main reason I stuck with it for so long. It is a place unlike any other I have ever experienced. I have definitely tried to take what I feel is a most practical approach to learning the language. In the beginning, all of my studies revolved around memorization. After reaching a certain threshold of vocabulary and grammar though, I felt the best way to learn was through reading news and navigating Chinese websites. However, there are definitely negatives to this approach. I never really worked on conversational Chinese until my first trip to Beijing two years after I began studying. I find reading books to be a very enjoyable method, mostly because it lets me learn at my own pace. Other than that, finding Chinese friends who want to help you out is really refreshing. I actually found it really helpful to play tennis while I was in China. This created an environment where I knew all of the vocabulary and could acclimate myself to thinking in Chinese. Usually, after playing tennis (or sports in general), I felt very clear-headed and could contribute much more to the conversations going on around me. The biggest mistake that I am guilty of myself is acting shy or humble during opportunities for conversation. On so many occasions, I would stay silent in order to either let a friend of mine practice or save myself grief. I’ve come to find there is no need for politeness when taking on a new language, especially in China. 鲜花插在牛粪上 (xiān huā chā zài niú fèn shàng) – literally, a fresh beautiful flower stuck in cow manure. Used on couples or people in a relationship, it means that the girl in some aspect is a lot better than the guy, it’s not a good fit (girl being the flower, guy being the cow manure). I’ve always just found it amusing. I feel as though any time a foreigner goes to a karaoke bar or gets on the late night subway, it gives way to a funny story. I’ll try to keep mine tame though. One of my most memorable experiences occurred when I was the only one to attend my class on a random Wednesday in Shenzhen. Instead of sitting through a lecture, my teacher invited me to the Sam’s club near my house. I obliged, we got on the Subway and proceeded to go shopping for her husband’s dinner. She did all of the navigating while I pushed the cart. It was a surprisingly western feeling until I realized how a young, male American pushing around a 60 year old Chinese lady’s bulk grocery items must have looked! Nothing huge. I did have somewhat of an “Aha!” moment returning to Beijing for a second go round. Leaving the first time, I had six semesters of Chinese under my belt. My understanding of the language was textbook at best. It took two more years for me to finally get back after that, and when I did, I could tell there was a palpable improvement. One of the most memorable exchanges I had was arguing with bartender over receiving an incorrect amount of change. He ended up being right, but it was nice to be able to voice my concern and understand his explanation. To be totally honest, my key motivations for studying Chinese have always been my desire to become a world citizen and my annoyingly competitive nature. I love the idea of learning something that can open doors for you in a completely different part of the globe. I have only ever been to countries in which I have a functional understanding of the language, and I have found that locals, more often than not, appreciate the time I have put in to learning how to communicate with them. It definitely has begotten experiences I would not have been allowed otherwise. Hmmm, hard to choose just one. It’s either 拍黄瓜 (pāi huáng guā) or 豆角烧茄子 (dòu jiǎo shāo qié zi). Lamb chuan is pretty delicious, too. Do your best to get out of your comfort zone. When traveling in China, it is really easy to get caught up in going out late and frequenting McDonald’s. My only advice would be to try to stave off those types of habits. If you’re not abroad, find a group of Chinese speakers at a nearby University, or go be the person who refuses to speak English at a Chinese restaurant. No one is going to hold practicing a foreign language against you. Thanks Nick for those tips and a hilarious story! Didn’t know you accompanied Qiu laoshi to Sam’s Club, haha (we had the same Chinese teacher in Shenzhen). FluentU is a new way to learn Chinese through authentic video content like music videos, movie trailers, news, and inspiring talks. Sign up for free here, like our Facebook & follow us on Twitter@FluentUChinese.